Restored 1875 Victorian Inn overlooking Lake Champlain and the Green Mountains of Vermont. Ideally located; walk to Marina, powerboat rentals, Beach, Yacht Club, 18 hole Golf and Country Club, Tennis, Summer Concerts and Theatre, as well as several outstanding restaurants. Enjoy hiking, fishing and exploring the many historical and geographic points of interest in the area. 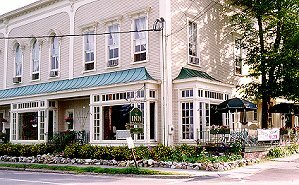 The Inn has ten very comfortable, spacious, air conditioned rooms, all with private bath. Several have gorgeous lake views. Full gourmet breakfasts are served on outside deck or in breakfast area overlooking the lake. Fireplaced lounge and art and craft shop for chatting or browsing. Library and game area for a rainy day. Rates: May through Oct. - $69 - $115 for double occupancy. Offseason: Nov-Apr specials and Golf discounts available. No smoking. Children over 5 years. Visa, MasterCard and AMEX accepted. Pet kennel nearby. This and other Westport Bed and Breakfast Inns can be found here in The Register.